Nov 13 The Firing Squad Assigned To Execute Maximilian I, Last Emperor of Mexico. French photographer François Aubert captures the firing squad assigned to execute Maximilian I, Emperor of Mexico. Their shots would stain the soil with Hapsburg blood and finalize the collapse of the short-lived Second Mexican Empire. 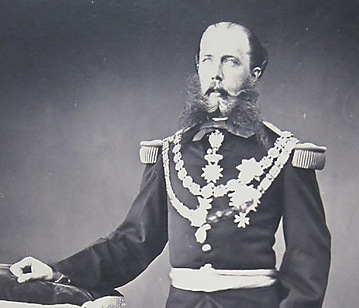 Mexico's failure to pay government debts provided the excuse for European expansion, and president Benito Juarez was attacked and displaced by Napoleon III of France, who installed Maximilian I as monarch on April 10, 1864. Juarez's forces were never actually defeated, and the lack of global recognition of this "puppet" government hurt any chances of legitimacy. Maximilian's reign was doomed before it began, and with the United States emerging from its own civil war to aid Juarez, the fate of this new Mexican empire was sealed. France withdrew troops and support in 1866, and Maximilian would be betrayed, besieged, and captured by 1867. On the morning of June 19, 1867, Maximilian faced the men pictured above, allegedly giving each an ounce of gold to ensure they wouldn't shoot him in the head, as he wanted his mother to be able to view him. His last words were "Viva Mexico, Viva la Independencia!" It seems the firing squad kept their side of the bargain. Nov 13 The Message General Eisenhower Delivered To Allied Troops On June 5, The Day Prior To The Invasion Of Normandy.